In past few years, business focus has been quickly shifted from technology to commerce, and now commerce to customers. Fast changing customer demands and technological advancements are forcing enterprises to become more scalable, agile & digital. In order to embrace digitalization, we need data insights. Data will play the role of a catalyst in your digital transformation journey. By empowering workforce, digitalization will help enterprises take robust business decisions driven by business insights. CEPTES works as a strategic partner in order to enable critical digitalization programs. 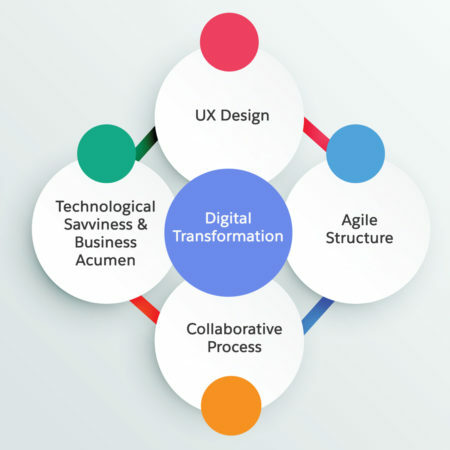 Our proven expertise and world-class solution delivery records have influenced many global enterprises to put their trust in CEPTES while working on the idea of digital transformation. In order to take better business decisions, organizations collect, analyze, and use information gathered from various sources. This helps them to stay competitive and gain insights. But the real challenge arises while managing the huge amount of data with existing legacy BI tools. To take optimized data advantage, it requires advanced statistical methods and technologies. CEPTES use Einstein Analytics focused on helping our customers gain valuable insights, identify opportunities, and minimize risks. Einstein Analytics will help you analyze both internal and external data within the Salesforce platform. Our Sales Analytics tools help in getting pipeline visibility and dashboards to track performance. Einstein Discovery helps you make smarter business decisions with the help of AI-powered suggestions and recommendations. We offer Wave Analytics services also called Analytics Cloud (Salesforce’s BI Platform) that is optimized mobile access and data visualization. You can work on large data files and create graphs, charts, and other pictorial representations. Wave Analytics helps users drill down key business insights with only a few clicks. CEPTES’s analytical solutions will definitely be going to boost your overall digital transformation journey. The global IoT market will reach $1.29 trillion by 2020. IoT is steadily growing up to transform businesses in every industry. Since Salesforce IoT cloud collaborated with AWS IoT to develop enterprise solutions, CEPTES has been focused on creating new ways of combining device data with customer data in Salesforce that enables businesses to develop significant customer experiences based on real-time activity across connected devices. We can help you get real-time business insights from customer behaviour by connecting all your IoT devices to all your Salesforce apps. 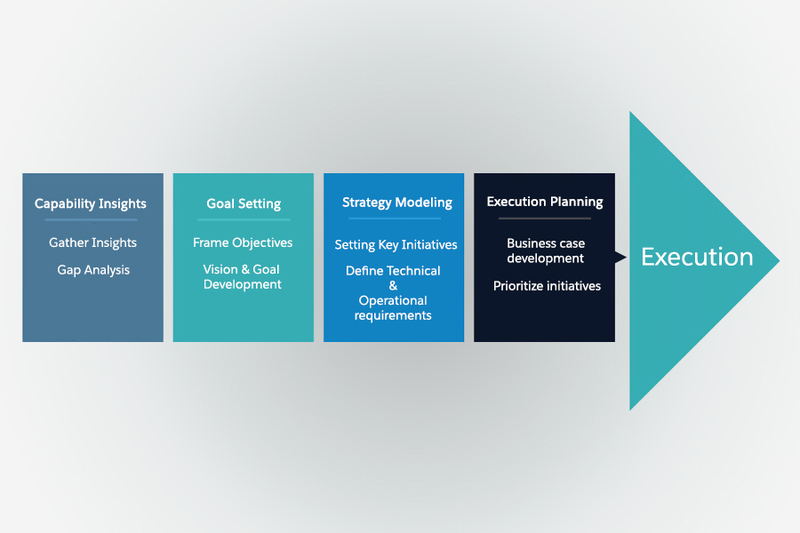 In order to boost your enterprise digital transformation process with the fuel of IoT, CEPTES can play the role of the accelerator by implementing right set of IoT strategies which will include building complete customer service profiles, data import from everywhere, seamless IoT engagement rule creation, developing applications for connected products with Salesforce platform, and unified view of all IoT devices in one place. CEPTES can intelligently connect all of your IoT data with Salesforce IoT. Now you can leverage the Internet-of-Things to better manage all aspects of your business such as sales, marketing, and service while putting all your focus on your customers. We can smoothly transit your traditional sources to connected smart devices with the help of Salesforce IoT cloud. Blockchain technology is the connectivity layer between your customers and your business. It can resolve complex customer service issues when integrated with Salesforce platform. If we implement blockchain properly, blockchain distributed ledger technology has potential to revolutionize customer experience management. CEPTES can develop robust cloud-based computing interfaces designed to incorporate business processes with the blockchain technology through Salesforce Lightning interface. We can design & develop applications for Hyperledger, Ethereum and Bitcoin blockchains, with support for public, private and permissioned blockchain implementations & transactions. Integrated with world’s #1 cloud service provider Salesforce, we can help your customers eliminate uncalled hassles like scalability, security, accessibility, and transactions. As businesses have various digitalization requirements and they need to leverage blockchain technology, CEPTES can enable businesses to offer solutions ahead of their competitors. With Salesforce integration, you can quickly see ROI with blockchain technology use.